Note: The Social Security earnings limit changes each year. This article is written with 2019 numbers. At one of my first speaking engagements, I heard a great story from one of the attendees about her experience with the Social Security income limit. A few years before, she’d been at her bridge club when the topic turned to Social Security. As they chatted about it, the consensus around the table seemed to be that filing at 62 was the smartest thing to do. This lady, trusting the advice of some of her closest friends, filed for benefits as soon as she turned 62. Once she started receiving Social Security income, she decided to buy a car she always wanted: a brand-new Toyota Camry. She was still working, which meant her Social Security check would be extra income, so she felt it was a good time to take on the car payment. So that’s exactly what she did: she bought the car, taking out a car loan that she planned to pay for with the income from her Social Security benefits. A few months later, she received a nasty letter from the Social Security Administration stating that she had been paid benefits that she was not eligible for. They not only asked her to pay the benefits back, but also informed her that her benefits would be suspended due to her income. Now she had a new car and a car loan, without the Social Security benefits to pay for it. What happened here? Something that surprises more than just the poor Camry owner who approached me that day: the Social Security income limit. The Social Security income limit is the amount of money you can earn before your earnings impact your Social Security benefit. If your income exceeds the Social Security income limit (which is defined based on your specific situation), your Social Security benefits will be reduced. It’s important to note that the earnings limit does not apply if you file for benefits at your full retirement age or beyond. These limits only apply to those who begin taking Social Security benefits before reaching full retirement age. Specifically, the income limit depends on where you are in the Social Security timeline and your age. Let’s break down he timeline mentioned above and take a closer look at how where you fall impacts the income limit and the benefits you might receive. The limit for the year in which you begin receiving benefits is calculated on monthly basis, because most people start receiving benefits mid-year. There are two slightly different formulas. Which formula you use depends on whether you retire mid-year in a year prior the year in which you reach full retirement age, or whether you retire mid-year in the same year in which you reach full retirement age. Here are two scenarios to help illustrate how the different formulas might work in your situation. To calculate your allowable earnings for the year in which you begin receiving Social Security benefits, multiply the number of months remaining after you begin receiving benefits times $1,470 (for 2019). This is the limit on how much income you may earn in the months between the time you start receiving benefits and the end of the calendar year. 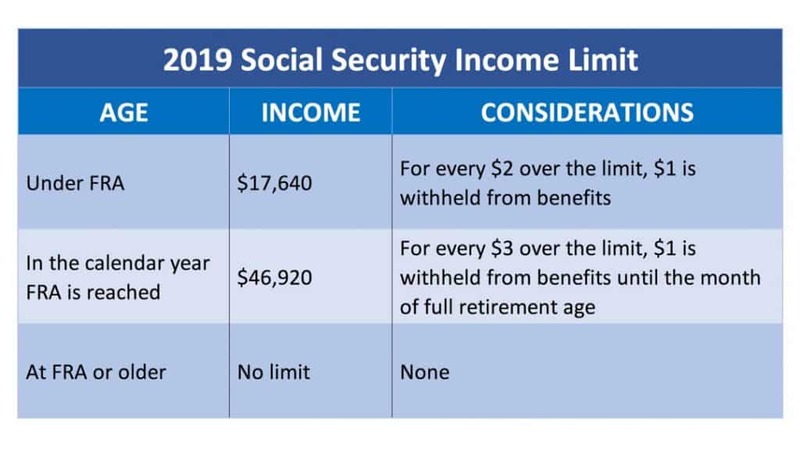 For example, if you started receiving benefits in July, you would be able to earn $8,820 (6 months X $1,470 per month) between July and December without hitting the Social Security earnings limit. If you start receiving benefits in the same year that you will reach full retirement age, but in a month prior to reaching full retirement age, you will have a limit for the months between the two events. The limit for earnings from working while on Social Security is calculated at $3,910 per month times the number of months between the date of retirement and reaching full retirement age. And in any scenario, the earnings limit is an individual limit. If you are still working, and your spouse is drawing Social Security, your earnings will not count towards their income limit. For each full calendar year between the year you begin receiving Social Security benefits and the year that you will reach full retirement age, you may earn up to $17,640 before your benefits are reduced. In the year that you will reach full retirement age, the income limit increases to $46,920 (for 2019) without a reduction in benefits. This means that if you have a birthday in July, you’ll have 6 months of an increased income limit before it drops completely off at your full retirement age. The increased limit allows many individuals to retire at the beginning of the calendar year in which they attain full retirement age. Once you reach that point, there’s no reduction in benefits regardless of your income level. There are two levels of benefits reduction. Like the income limit, benefit reductions are tied to your age (relative to your full retirement age). For each year before the calendar year in which you reach full retirement age, you will lose $1 in benefits for every $2 that you earn beyond the Social Security income limit. In the year you will reach full retirement age, but before the month of your actual birthday, you will lose $1 in benefits for every $3 that you earn beyond the Social Security income limit. To put these numbers into context, let’s look at an example of how this might work in a real-life scenario. Rosie is 63 years old. She started taking Social Security benefits as soon as she turned 62 in 2016 — but based on her birth year, her full retirement age is 66. Right now, Rosie is eligible for $20,000 in Social Security benefits per year. She also worked during the year and made $27,640 in wages. In 2018, Rosie filed for Social Security and received her first check in January of 2019. Throughout the year she received $1,667 every month. Without knowing the rules, she also worked and earned $27,640 in wages. With an earnings limit of $17,640, she was over by $10,000. Because this is a full calendar year during which Rosie is receiving benefits but is not yet full retirement age, the benefits reduction amount is $1 reduction for every $2 in excess wages. Since she was over the limit by $10,000, her benefits will be reduced by $5,000. With the benefits reduction for exceeding the income limits, Rosie Retiree’s $20,000 yearly allowed benefit is now a $15,000 benefit for the year. The most confusing part of the benefit reduction due to income is how it’s reflected in your monthly benefits deposits. Instead of taking out a little bit every month, the SSA will withhold several months of benefits at a time. If you predict in advance that you will have excess earnings and report this to the Social Security Administration, they may take a few months of benefits before you actually earn the anticipated excess earnings. For example, if your Social Security payment is $1,667 per month and you expect to receive $27,640 in wages from your job, the Administration would calculate that you’ll be over your earnings limit by $10,000 and thus $5,000 in benefits should be withheld. They would then withhold your benefit payment from January to March. In April, your checks would resume. If you don’t report excess income before your earn it, then you have to report this information after the fact. You can do this when you file your income tax return, but the preferred method is to be proactive and call your local Social Security Administration office. If you wait for the Social Security Administration to learn of your excess earnings via your tax return, there could be a significant gap between the time you earn the excess income and the time that they withhold your benefits. In most cases, it’s better to report the excess earnings quickly so the benefits reduction occurs closer to the time you actually earn that extra income. Regardless of whether your benefits are withheld in advance or in arrears, benefits withholding can make budgeting and planning difficult, especially if you don’t understand the system. You may need to create a separate savings account to set some of those earnings aside to compensate for benefits withholding that will occur in the future. The Social Security income limit applies to gross wages and net earnings from self-employment. Most other income is exempt, including pensions, interest, annuities, IRA distributions and capital gains. The term “wages” refers to your gross wages. This is the money that you earn before any deductions, including taxes, retirement contributions, or other deductions. But there are some cases where a special payment is made and it isn’t clear whether or not it should be counted as “income” for the purposes of the earnings test. In fact, the Social Security Administration list 88 different types of such payments in their piece Summary of How Major Types of Remuneration Are Treated. For example, if you receive sick pay in the first 6 months after retiring, it will be considered as “wages” under the earnings test. If you receive the sick pay in the 6 months after retiring, it doesn’t count. These special payments have affected more than a few clients that I’ve helped over the years. One client had a “working interest” in an oil and gas drilling partnership. This meant that he shared in the expenses of the partnership and thus received a higher share of the revenue. This is in contrast to a “royalty interest” where the investment is limited to the upfront money only. In either case, he didn’t actually do any work. He just collected checks from his mailbox on a monthly basis. But because he shared in the expenses of the company, the income from the drilling partnership was considered “net earnings from self employment” and counted against the earnings limit. If he would have held a “royalty interest” only, the income would not have been counted. The important thing to remember is that generally speaking only wages from a W2 or your net earnings from self employment will count against the Social Security income limit. However, there are other payments and factors that can trigger this earnings test and reduce your benefits. For example, consider the Substantial Services’ Rule for self-employed individuals. This rule essentially replace the “income” limit with a “time spent working” limit. Generally speaking, it will apply to individuals who work in their business more than 45 hours per month. However, if the work is considered highly skilled, it can also apply to you if you work as little as 15 hours per month. I’ll tell you this rule is ambiguous and is open to some interpretation. So understanding this rule and getting advice on this is very, very important. If you are self-employed, less than full retirement age and plan to work more than 15 hours per month, please get the advice of a professional who understands this topic. Additionally, if you receive a letter from the Social Security Administration alleging that you are subject to the income limit due to one of these special payments, don’t immediately believe them. I’ve seen more than one case where the SSA informed a client they were in excess of the limit, when in fact the earnings were not countable. If you’re subject to the Social Security income limit, don’t wait for the SSA to start reducing the benefit you receive. Instead, I’d recommend voluntarily suspending benefits. If you wait for the Social Security Administration to discover that you’ve earned too much working while receiving benefits, your risk of an overpayment notice is higher. In any case, if your benefits are withheld because you earned more than the Social Security income limits, don’t worry: you aren’t missing payments that you’ll never get back. Your benefit amount will be recalculated at your full retirement age (or when you stop working) to reflect the months that benefits were withheld. I’m in SSDI. I will receive a settlement money from an accident I had last year. Do I have to report this money? What if your ex is requesting child support end and child collects social security from his social security? He has also stated that at 17 1/2 child will receive payment intead of parent raising child. How does this really work? If I had a business and drew only a wage in accordance to SS, legal? Is drawing early SS due to disability the same as retiring early? Contact us via Email: (michaelnordmannloanfirm@gmail.com) God bless you all. Great Article! I have a question about the special first year rule and am not finding the answer. I was downsized in 2/18 and have not found a job since. I also turned 62 in 12/18 and filed for my Social Security in 11/18. My checks are to begin in 2/19. Assuming I will find a job this year, do I qualify for the special first year rule, in that I will not be limited in my earnings while receiving my Social Security checks? Thank you! I understood that there is no limit in earning after age seventy in any circumstance. Is that true? If I begin receiving benefits at 62, and these are reduced because I am over the income amount allowed, what will my benefit be when I reach FRA? 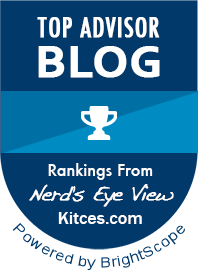 The above article states “don’t worry, you aren’t missing payments that you’ll never get back, and that the benefit amount will be recalculated at FRA to reflect the months that benefits were withheld. This is a little confusing. Nice article but you never mention anything about married filing jointly. If joint income exceeds $17K but my personal income does not, which counts? As long as my own income is under $17K I am ok even if filing jointly with household income well in excess of $17K? You should have mentioned the amounts for married ss recipients. 32k/yr is the limit for married in 2018 before they tax benefits until FRA. I am totally confused. During the year I reach FRA, SSA says I can earn up to $46,920 in the “months prior to the month of NRA attainment”….in my case September 2019. Then they turn around and say I can’t exceed $3910/month (46920/12). Well, which is it?? Got that overpayment letter.not sure how 2 fill it out. According to Social Security the earnings limit if you retire mid year the year before your full retirement year you can only make $1420 per month not the total of $1420 times the number of months remaining int the year you retired. Any month you earn more than $1420 you they take away the check for that month. Which is correct?